All About Hinduism ( hinduismforchildren.com) is moving to a new address. But not to worry it’s still the same blog. Email subscribers will continue to get notifications and WordPress followers will find new posts in their Reader. The new site will allow me greater flexibility which hopefully will mean a better blog for you to enjoy. Over nine days the festive fervour of Navratri builds up to heightened activity on the eight and ninth days and ends in a crescendo on Vijayadashmi,the tenth day of the tenth day of the month of Ashwin. It is one of the most auspicious days in the Hindu calendar and is steeped in layers of ancient traditions. Vijayadashmi literally means victory on the tenth day. 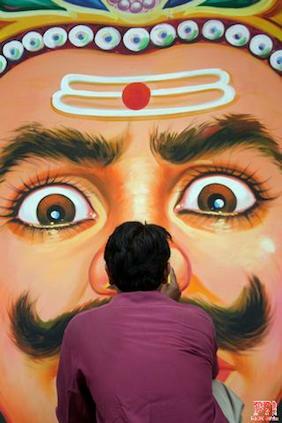 Legend has it that on this day King Rama killed the ten headed demon Ravana in Lanka. 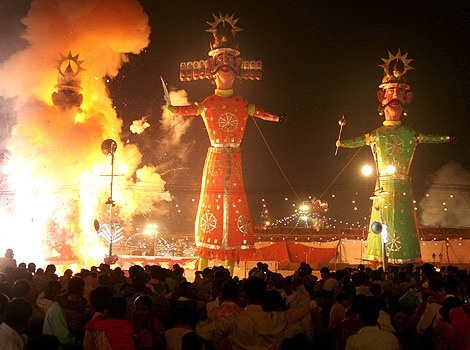 Hence the festival is also known as Dusherra, meaning das-harra or ten heads. 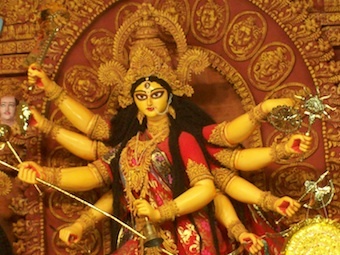 It is also the day when Durga is said to have slayed the demon Mahishasur ending a long raging battle. Thus Vijayadashmi celebrates the victory of good over evil. Not just in historical and mythical wars but on the battlefield of life. The Nine Nights of the Goddess symbolically end in the spiritual regeneration of every devotee and aspirant. In another story, Hindus believe that during Navratri, Pravati the daughter of the mountains and the wife of Shiva comes to visit her parents. Before she departs on the ninth day to be re-united with Shiva in the Himalayas, she blesses her people with a bountiful harvest. This is critical. For the end of Navratri marks the beginning of the harvest before the long winter sets in. And so the blessings of the Divine mother who represents abundance in all forms, are sought and received. In the cities away from the farmlands, it is the day to start all new ventures and strike new business deals. The day to buy gold and houses. And as such it is a national holiday with different parts of India celebrating it in their own special way. 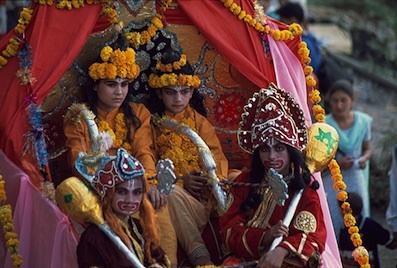 In the north of India and in Maharashtra Ram Lila, the story of Rama is enacted in the streets by drama troupes and ends in the burning of large effigies of the ten-headed Ravana. In Maharashtra gold coin shaped leaves of the apta tree are given to the elders in the family seeking their blessings and to friends wishing them prosperity in the year to come. In the south of India, Saraswati, the Goddess of Learning, is worshipped making this a preferred day to begin formal education. 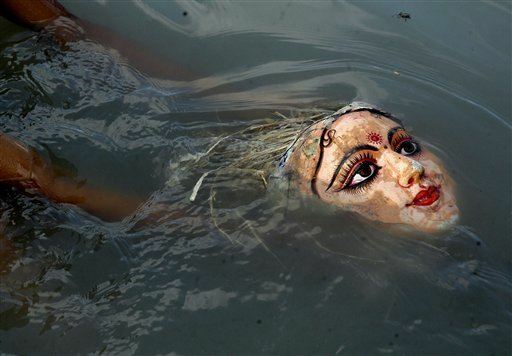 In the east, especially Bengal, Vijayadashmi marks the end of Durga Puja and the Goddess is returned to her home by immersing her idol in a river or the sea. This year however the navami and dashmi overlap as per the lunar calendar and both the ninth and tenth day will be celebrated today. 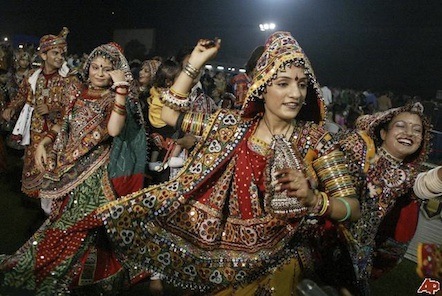 The festival of Navratri began last night. For nine nights to come the Goddess, Devi will be celebrated and worshipped in all her names and forms across India. From the personal kul devi, goddess of the clan to gaon devi, guardian of the town and finally as her all encompassing avatars of Durga, Laxmi and Saraswati she will reign over our hearts and minds. But essentially she is Shakti, the nameless, formless energy that manifests as the ever changing Cosmos. She is the creative feminine principle. She is the Divine Mother. Just as she holds up the cosmos, she sustains us too. Nurturing us and holding our hands as we navigate our lives. To her we turn for courage and comfort. And to her we turn to find ourselves. Although the festival of Navratri is a joyous celebration marked by elaborate pujas, feasts and dancing through the night, it has a deeply spiritual significance. For the first three nights we worship the Goddess as Durga, the warrior goddess who armed with her many weapons destroys all evil. We pray to Durga that she many transform all that is petty and limiting within us, and dispel the ignorance and darkness that envelopes us. For it is only when we are freed of all negativity that we can open our hearts and lives to all things positive. It is then that we are ready to worship Laxmi, the Goddess of Abundance. For the next three days we pray to Laxmi that she may fill our open hearts and lives with wealth, both material and spiritual. For it is only when we have tasted abundance and experienced the expansive nature of the Universe that we become ready to receive knowledge and learning, the greatest wealth of all. So the last three days of Navratri are devoted to Sarswati, the Goddess of Learning and Arts. She is also the goddess who holds the secret to the highest knowledge of all, the knowledge of the Self. We pray that she may grant us that knowledge. The nine nights are then a journey of the Self towards itself. And, even if we take but just a step, we have at least begun the journey. Happy Navratri to you !! The seasons are shifting. There is a distinct autumnal nip in the air and as the days get shorter it is the time for the Hindu calendar to come alive with some spectacular nighttime celebrations. In the run up to Navaratri, when we worship the Goddess or the divine mother, and rejoice in her blessings, my mind is on a particular manifestation of the Goddess- the Earth. She is Prithvi, the Mother Earth, and represents the feminine, creative and transformative energy of the Universe. She makes our life possible and sustains it. And in worshipping her we worship Shakti the Cosmic energy that pervades the Universe. Last week IPCC, the International Panel for Climate Change announced that global warming is definitely happening and that they are now 95% certain man has been its major cause. As if we needed figures to confirm what we are already witnessing all around us. But, it’s good to to have scientific backing. Might help get the naysayers on board and move some political will in the right direction. Great, I thought, now we can all get serious and do something about this. However, days later, solutions are not what we are talking about. Far from it. A debate rages on ….What about the other five percent? Why are the scientists not a hundred percent sure? Was the hype about global warming just scare mongering to get us to recycle? Were we being taken a for a ride all this while? Do we really need all those wind turbines ruining the countryside? I don’t get it. Isn’t a 95 % probability worrying enough? Shouldn’t we recycle anyway….good housekeeping has great merits. And, isn’t it nice that we have a countryside to dot with wind turbines? It’s a ridiculous debate. We are refusing to accept the mess we have created lest we may be asked to clean it up. And so we remain belligerent, arguing endlessly but missing the point- we cannot afford to take a chance. It could end up costing us the Earth. Literally. We don’t need science or religion to tell us this. As infants our instincts told us we couldn’t survive without our mother and as little children we thought she was our entire world. What we need is a return to that innocence. When we ‘feel’ not ‘think’ that we need to hang on to Earth for dear life. We need to bring back that sense of awe and wonder the early civilisations felt when they looked upon the natural world. That sense of watching something divine and mystical unfold before us, everyday. And we need to let our children in on the magic too. If they are not lucky enough to enjoy the countryside then let them nurture a potted plant on a window sill in a crowded city block. Catch a sunset or two. Perhaps watch a full moon on some night. Because if we don’t, they will care even less than we do and then even the debates will stop. So I am hoping that when we celebrate Navratri this year, we will be touched by more than just the festivities. That we may feel the divine Mother manifesting within and without. 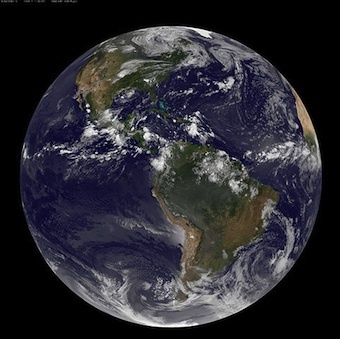 The Atharva Veda has a beautiful hymn called Prithvi Sukta, In Praise of the Earth. Here is a small excerpt. I am not sure who translated it but it is beautiful and a reminder of the wonder that we once felt. May she confer on us the finest of her yield. and endow us with lustre. be for our welfare, free from sickness and waste. bearers of tribute to thee. uphold me in grace and splendour. Lat year when I was visiting Bombay, I saw someone wearing a t-shirt which proclaimed, I was an atheist till I realised I was God. It made me chuckle. It was a clever spin on the now well known Vedanta philosophy of non-dualism which states – That which is without is within. The same One pervades everything. The Self is God. But is it really that simple and how did we come to this understanding? What does it really mean? This brings us to the most fundamental discovery made by sages of the Upanishads. As the rishis delved into the depths of human consciousness peeling layer after layer of awareness they found that the mind is not consciousness, it is only an instrument of consciousness. When the concentration is so profound that the mind-processes have come to a stand still and awareness has been consolidated even beyond the mind, little remains except for the awareness of “I”. Space and Time vanish and you rest in meditation in what the Taittiriya Upanishad calls the “body of joy”, a silent, ethereal inner realm at the threshold of pure being. In this silence, Shanti, you become aware of something vast, intimately your own but not the finite limited self you had been calling “I”. No amount of will can erase this “I”, the thin veil of personal identification that seperates us from infinite consciousness. Yet, in deep meditation it suddenly vanishes. This state the Upanishads call turiya – literally “the fourth” for it lies beyond waking, dreaming and dreamless sleep. Turiya, the Upanishads say, is waking up in dreamless sleep. In later Hindu thought this awakening came to be know as samadhi, complete absorption or moksha, liberation, for it brings freedom from all conditioning and the limitations of mind and space. The Upanishads tell us that when the ‘I’ has dissolved and the observer and the observed become one, just chit remains. Pure undifferentiated consciousness. This is our real Self. And, it is identical with the undifferentiated unity which the sages called the Brahman.This is not a reasoned conclusion but something that is experienced at the very centre of one’s being. The Self is Brahman – is the central discovery of the Upanishads which gave birth to Its most famous mahavkya, formulation : “Tat twam asi” – You are That. “That” is the characteristic way in which the Upanishads point to a Reality that cannot be described; and “you’ is not the petty, finite personality but the pure consciousness that ‘makes the eye see and the mind think’ – the Self. And thus we come to the basis of the non- dualistic Vedanta philosophy – The Atman is Brahman, the Self is God. To understand Self then is to understand God. So what is the nature of this Self? The Upanishads go to great lengths to show it to us and we will look at some of the explanations in the next post. Posted in Scriptures, Uncategorized, Vedas and tagged Atman, Brahman, tat twam asi, Upanishads, you are that. The Upanishads are not a philosophy. They do not explain or develop a line of argument.They are darshana, ‘something seen’ or ‘experienced’. In this context it is clear that the questions the Upanishads record – “What happens at death? What makes my hand move, my eyes see, my mind think? Does life have a purpose or is it governed by chance?” – were not asked out of mere curiosity. They show a burning desire to know the underlying principles of life. A fervent desire to know is what motivates all science. And, “All science,” wrote Aldous Huxley, “is the reduction of multiplicities to unities.” Nothing is more characteristic of Indian thought. The Vedic hymns are steeped in the conviction of rita, an order that pervades creation and is reflected in each part – a oneness to which all diversity can be referred. From this conviction follows a highly sophisticated notion: a law of nature must apply uniformly and universally. In renaissance Europe this realisation led to the birth of classical physics. In ancient India it had equally profound consequences. While the rest of Vedic India was trying to know and understand the natural world and making great strides in medicine, mathematics and astronomy, the sages of the Upanishads focussed on knowing the medium of knowing: the mind. The sages wanted more than explanations of the outside world. They sought principles that would explain the whole of human experience, including the world within the mind. The sages of the Upanishads show a unique preoccupation with states of consciousness. They observed dreams and the state of dreamless sleep and asked what is’ known’ in each and what faculty could be said to be the ‘knower’ . The study of the consciousness was called brahma-vidya, which means both “the supreme science’ and ‘the science of the Supreme’. Brahmavidya is in a sense a lab science: the mind is both object and laboratory. Attention is trained inwards, on itself, through a discipline the Upanishads call Nididhyasana: meditation. In the Brihandaranyaka Upanishad there are long and haunting expositions of the states of mind the sages explored. They called them waking, dreaming, and dreamless sleep and somehow made the brilliant observation that these were also layers of awareness. Different strata of consciousness. In dreaming, the Upanishad observes, we leave one world and enter another. Which to the body and mind seems as real as the waking world. So when we wake up from a dream we do not pass from unreality to reality, we pass from a lower level of reality to a higher one. If the waking experience is impermanent should there not be something more abiding to support it? Might it not be possible to wake up into a higher state, a level of reality above this world of constantly changing sensory impressions? The sages found a clue: in dreamless sleep the observing self detaches itself not just from the body but also the mind. This still world they found is always present in the depths of the mind. What if we woke up in the very depths of the unconscious when thought itself has ceased? Here the Upanishads are like pages from ancient log books recording journeys into the uncharted waters of the world within. Today is Guru Purnima. The full moon night of the month Ashaad when we honour the memory of the great sage Ved Vyasa who compiled the Vedas and our own gurus who guide us. India has had a long tradition of revering and worshipping teachers. The guru or the teacher holds a place of paramount importance in our lives and our society. So important is the guru that he is considered to be a form of the Supreme Brahman, the Godhead of all knowledge. 1.2: The Guru is the Para-Brahman (Supreme Brahman); Salutations to that Guru. Although the guru has become synonymous with spiritual teachers and leaders, a guru is anyone who instructs or guides us in any area of our lives.The word ‘guru’ is made up of two words, ‘gu’ meaning darkness and ‘ru’ meaning light. A guru is someone who leads us from darkness into light. In the ancient gurukul system, children left their homes at the age of 6 or 7 and went to live with a guru in his forest academy till they reached adulthood. The guru became their guardian and teacher and was responsible for preparing the students not just in academics and other skills but also for life. This tradition continues unbroken in some areas of learning even today. All the classical and performing arts are still passed down directly from guru to shishya in a personal and often life long association. Our earliest teachers are our parents, or grandparents. Then our school teachers and teachers of the arts. When we get older we many seek a spiritual guru. Today we honour all of them. School children will bring flowers for their teachers. Students of art and music will pay their respects to their teachers and seek their blessings by touching their feet. And spiritual aspirants will worship their gurus and intensify their sadhana. Aum. For another more detailed write-up on Guru Purnima here is a link to the wonderful Speaking Tree. An Upanishad is an utterance of mystical truth that has come down to us as an attachment to the Vedas, the ancient and scared hymn collections. Etymologically the word ‘Upanishad’ suggests “sitting down near”: that is, at the feet of an illumined teacher or guru in an intimate session of spiritual instruction. In the Upanishads the Guru takes many forms and the settings are dramatic: a wife asks her husband about immortality, a king seeks instruction from a sage; one teenage boy is taught by Death himself, another by fire, beasts and birds. Sometimes the sages are women. The Upanishads record such sessions but their purpose is not so much instruction as inspiration. They are mean to be expounded by the teacher from the basis of personal experience. Although we speak of them together as a body, the Upanishads are not part of a whole like chapters in a book. Each is complete in itself, an ecstatic snapshot of transcendent Reality. When the texts were composed and by whom we don’t know. The sages who gave them to us did not care to leave their names: the truths they set down were eternal, and the identity of those who arranged the words was irrelevant. Fascinatingly, although the Upanishads are attached to the Vedas, they seem to come from an altogether different world. While the Vedas look outward in reverence and awe of the phenomenal world, the Upanishads look inward, finding the powers of nature only an expression of the awe-inspiring powers of human consciousness. They tell us that there is a Reality underlying life which rituals cannot reach. They teach that this Reality is the essence of every created thing, and the same Reality is our real Self, so that each of us is one with the power that created and sustains the universe. And, finally, they testify that this reality can be realised directly, without the mediation of priests or rituals or any of the structures of organised religion, not after death but in this life. And, that is the purpose for which each of us been born and the goal to toward which evolution moves. How did the sages realise this Truth they testify to? By adopting what we know today as the Scientific Method of questioning and investigating phenomena. We’ll look at Upanishads as the Supreme Science in the next part of the series. Vedas- An Introduction by Eknath Easwaran. As I was drafting my post on the Upanishads based on my favourite translation of all times, The Upanishads by Eknath Easwaran, I read again his introduction to the Vedas. And, although my last post gives a brief summary, I think Easwaran’s introduction gives the essence and makes a wonderful starting point in the quest to understanding the Upanishads. So here it is in an abridged form…. The religion of the ancient dwellers of the Indus Valley was based on ritual sacrifice and lyrical, life-affirming hymns meant for incantation in an ancient form of Sanskrit. These hymns dating back from perhaps 1500 B.C reveal an intimate, almost mystical bond between worshipper and environment, a simultaneous sense of awe and kinship with the spirit that dwells in all things. Even in translation they have compelling beauty. They worship natural forces and the elemental powers of life: sun and wind, storm and rain, dawn and night, earth and heaven, fire and offering. These powers are the devas, gods and goddesses. In hymns they seem very near, present before us in the forms and forces of the natural world. Fire or Agni is worshipped as the actual fire on the hearth or altar and as the divine priest who carries the sacrificial offerings to the gods. The storm is Indra, leader of the gods, lord of war and thunder who rides on his swift chariot to fight the demons of the Sky. The wind is Vayu. Night is Rati and dawn is Usha, the loveliest and most luminous of all goddesses.The sun is Surya who rides his chariot across the sky, or Savitri the giver of life. And death is Yama, the first being to die and thereby first in the underworld. These poetic outpourings, were chanted while offerings were poured into the fire. Such fire ceremonies were performed for the Kshatriyas, warriors and rulers of clans by the Brahmins whose function in society was to preserve rites already too ancient to be understood. As time passed, Brahmins produced commentaries to explain the meaning of these ancient rites. Hymns and commentaries together became a sacred heritage passed from generation to generation. These are the Vedas, India’s scriptures. Veda comes from the root vid, ‘to know’. TheVedas, Hindus believe are revealed knowledge or Shruti, given to humanity at the dawn of time. They exist in four collections: Rig, Sama, Yajur and Atharva, with Rig Veda being the oldest. The first part of each collection, called karma-kanda, preserves the hymns and philosophical interpretations of rituals used in Hindu worship to this day. The second part, called jnana-kanda, concerns not ritual but wisdom: what is life about; what death means; what the human being is; what is the nature of the Godhead that sustains us; in short the burning questions that men and women have asked in every age. The ritual section of the Vedas define the religion of a particular culture; but the second part, the Upanishads, is Universal and as relevant to the world today as it was to Hindus five thousand years ago. So what is an Upanishad? We will look at it in some detail in next series of posts. I must apologise for not posting anything for a while. Life got in the way. As it sometimes does. But I am back now and there is some good news to share. My very first book, a collection of poems and art goes to the printers today. Super excited! With poetry still on my mind, I am reminded of all the wonderful songs and verses by the poet saints of India. In the spirit of the moment I am sharing a few of my favourites here for you to enjoy. All religions have a wonderful spin-off – inspired creative expressions that come from depths of the soul. Whether it is in art and architecture or literature and music some of the most fantastic works in history have come from a deeply religious or spiritual place. On this blog I hope to keep bringing you both sublime and awesome works from ancient and contemporary Hinduism. But for now the poems. These are taken from the book Women in Praise of the Sacred and are by two well known women saints of India, Mirabai and Mahadeviyakka. I do not say nothing as happened. My friend, I went to the market and bought the Dark One. You claim by night, I claim by day. Actually I was beating a drum all the time I was buying him. You say I gave too much; I say too little. Actually I put him on a scale before I bought him. and all my inherited jewels. Mirabai says: the Dark One is my husband now. Be with me when I lie down; you promised me this in an earlier life.